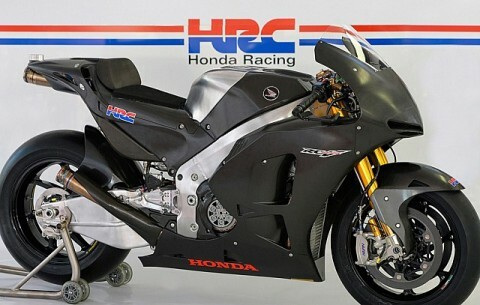 Honda Racing Corporation presented in Valencia Honda RCV1000R prototype that will compete in 2014 in the “Open” in the world of MotoGP category: hardware and software of Magneti Marelli, 24-liter capacity and 12 engines per season. Along with the Executive Vice President of HRC Shuhei Nakamoto, the Director of the Tomonori Sato project has submitted the motorcycle to the international media, awaiting its first appearance on the track. The RCV1000R chassis is based on the current RC213V prototype, like the engine, a 90° V4 of 235 HP at 16,000 rpm, and a spring-loaded valves and traditional gearbox. The bike will be delivered with Ohlins suspension and Nissin brakes, without seamless change. Four drivers will compete in 2014 with RCV1000R, Nicky Hayden and a second pilot to be confirmed in the Aspar, Scott Redding (Honda Gresini Team) and Karel Abraham (Cardion AB Team). The double world champion Casey Stoner, who has acted as tester HRC, has already worked with the RCV1000R and has expressed a positive opinion of HRC engineers.